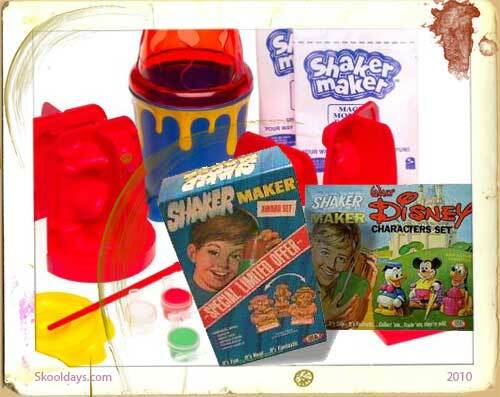 The Shaker Maker sets came in all sorts of characters, from Flintstones to Frankenstiens, Daleks to Disney. There was also Shaker Maker Pictures such as the Farm and Zoo Animals. This allowed you to make 3-D animals and glue them to different background pictures. 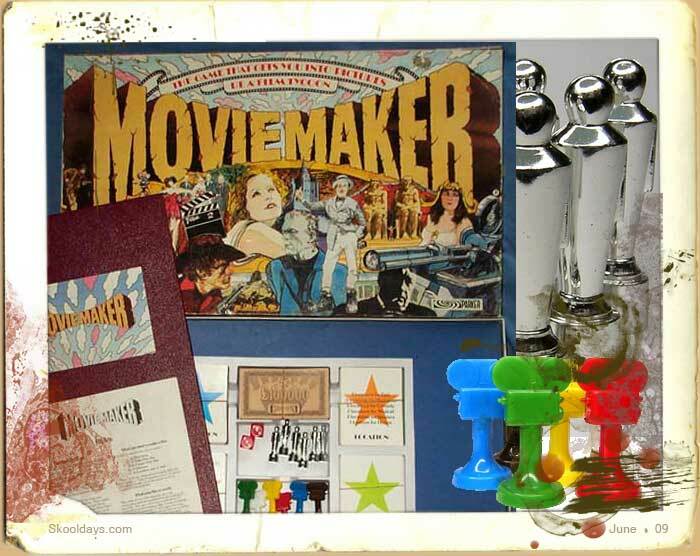 It included pictures, paints, brushes, around 10 Magic Mix packets and the plastic moulds. After Shaking and Making it would come out like a milky jelly like substance then harden over time. They eventually went crusty and shrunk to quarter the size, becoming targets for your neighbours air rifle, like most of our priceless collectable toys did back then if left out on the fence! Shaker Maker was made by Ideal and was released early seventies. We called the liquid “magic mix” it seemed to be a hit and miss operation sometimes the mix was wrong and it would never harden. Make sure you fill cap with cool water. normally there is a line marked on the side so you would aim for that. Add the special Magic Mix from the package into the water. Close the moulds halves around the cap. Close the shaker-maker bottom over assembled mold halves and shake with bottom for 30 seconds. Turn shaker over and place on a table and wait ten minutes – this was impossible for a kid – believe me!. Now the fun – take off the bottom part. Place figures of the drying stand and when it’s dried you can then paint the details and create your characters unique colours. 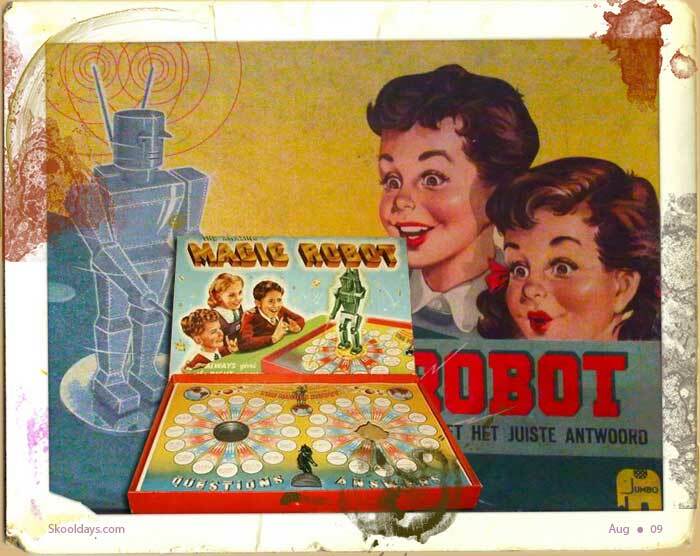 Though this was a massive success as a toy of the Seventies, it did receive a resurge in popularity in the nineties. I remember characteristics of this toy I wanted when I was about five or six and mommy said she didn’t have enough money for all the things we wanted. 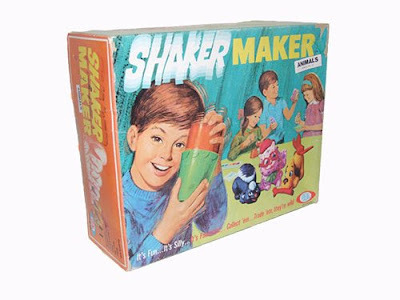 Thinking about it today at 47 years old, I googled the year 70s and characteristics and here it is Shaker Maker. The internet is a fabulous tool.